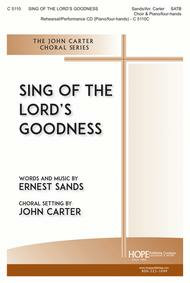 Sing of the Lord's Goodness composed by Ernest Sands. Arranged by John Carter. For SATB choir & piano, 4-hands. Sacred, God's Attributes/Character, Praise, General. Octavo. Published by Hope Publishing Company (HP.C5110).Not only a wonderful and uplifting song of praise, but a distinctly memorable one for its unique rhythmic pattern of five beats per measure. John Carter has appropriated Dave Brubeck's "Take Five" in a four-hand piano accompaniment that is accessible and fun to play - a wonderful celebration of the Lord's goodness.